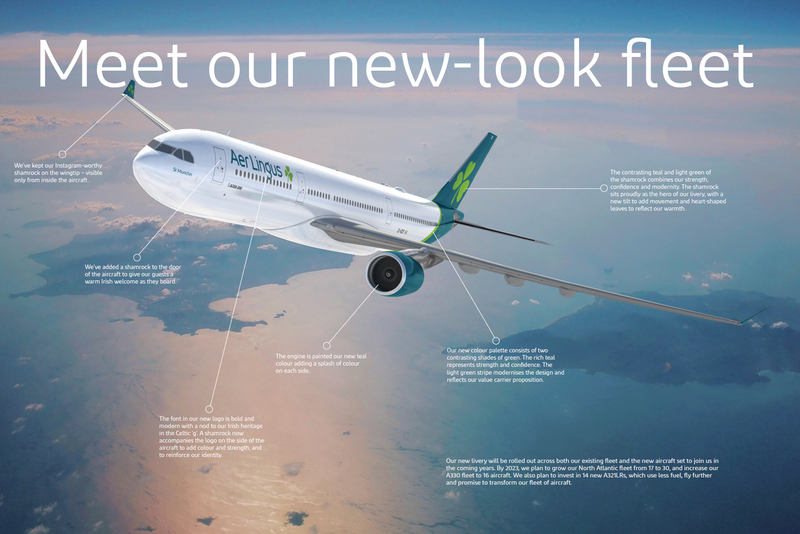 Earlier today, Ireland’s national carrier, Aer Lingus, launched its new aircraft livery. It’s the first time the image has been updated in over twenty years . And for an airline which has basically owned the colour green, it’s quite a departure. The new look will mean aircraft will be mostly white, with a strip of teal and a light green shamrock on the tail, along with teal engines and shamrocks on the winglets. Inevitably, reactions online were mixed. But of course, the internet is where you go where you want to find a fight with someone over something inconsequential. As for me, I like the new look. It’s fresh, minimal and modern. I’m no plane-spotter, but I’m Irish and I find re-branding exercises interesting. I’ll admit, I enjoyed seeing their aircraft in retro livery in the last couple of years, when planes were done up in 1950’s style logo and colours. But that was a gimmick and not something I’d want to see on all their aircraft. I’ll be interested to see what it means for crew uniforms and interiors. I’m an occasional Aer Lingus ‘guest’ (their terminology, not mine), only when flying between London and Ireland. My last few flights have been great and I can’t fault the standard of service on board. I haven’t flown long haul with them in an incredibly long time. My last trip like that was to Boston, which is over twenty years ago! And of course I spent many a journey on them as a child, flying between Dublin and Edinburgh, on trips to visit grandparents. Flight was so exciting and exotic in those days, and I flew as an unaccompanied minor. I still have great memories of the lovely ladies from Aer Lingus who escorted my seven year old self through Dublin Airport and on to the plane. But now that they’re flying to Dublin out of London City Airport, I may use them more often. I’ve watched with a little jealousy as their flights to Dublin boarded while my British Airways flights to the same airport were consistently delayed. Hmmm. In fact, this April, I’m flying Aer Lingus to Dublin on the first leg of an epic journey to Singapore – via Milan, Doha and Bangkok! But that’s a story for another time. Anyway, a new look for Aer Lingus and a new flight option for me. Thumbs up. Previous: Previous post: 2019: Prepping for a year of travel! I, too, liked the retro look. I’m weird, though. I do love teal of any oh, gosh. I’ve forgotten the word for from lightest to darkest. Anyhoo: ANY teal. We’re travelling at the moment and so I got my first view of the new livery on Thursday. I like the colour choice, makes me think of the old ‘air mail writing pads’ we used to have at home (70’s kid!). It’s the new *typeface* I like most, and Aer Lingus have been busy pushing it out on their app and website. I like the rebranding, I approve!